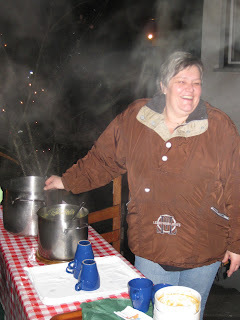 Last night we celebrated New Year starting with hot soup and hot apple cider by a crackling fire. 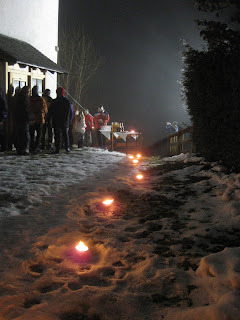 Later we had a wonderful multi-course dinner in the Gastube and a walk up the hill to the Chapel to ring in the New Year. This is my 3rd time here for New Year's Week and it was fun, as usual, but I must admit I missed my lady back home in NJ. One day I hope to take that walk with her. 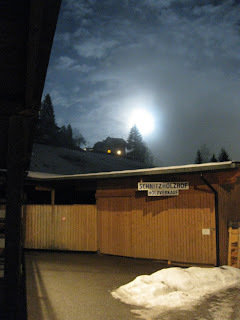 Last night was a Blue Moon and when the fog banks would pass you could see the snow capped Austrian Alps in the background bathed in moonlight. I tried to take a picture, but without a tripod it was virtually impossible. Today we go back to work at 2:30 and I would like to pick out a new project for the last day and a half. Pretty well finished her up. I did some back cutting to free the tail end of the silk scarf off but decided not to go to crazy thinning it out from behind. Pascal mentioned something about hollowing it out. He's left for today and I'll find out tomorrow around midday when classes resume. It's raining outside and the ground is very icy. I don't think we will be walking up the hill tonight to ring in the New Year. All for now. 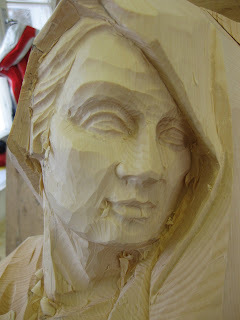 Today was not only Wednesday but it was "over the hump day" on the woodcarving. Things are all coming together for me today. 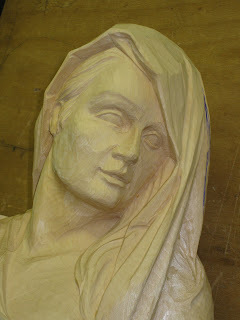 The face is pretty well finished up with the exception of some finessing. 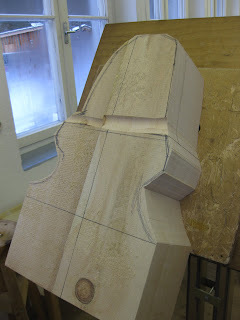 Pascal had a great idea for the base of the carving. 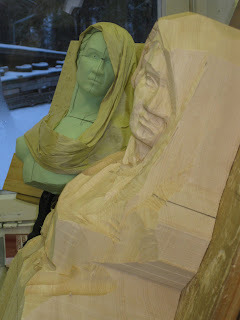 He suggested I take the tail of the scarf and use it as a great ending for the carving. It looks as though it would be blowing in the wind and creates an "S" shaped flow to the carving carrying one around to the bottom and then back. 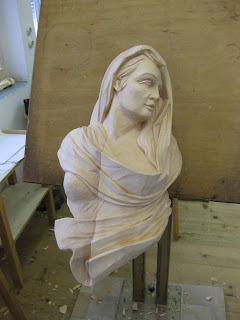 I couldn't be happier and I feel as though the light bulb went off on setting up drapery on the second side of the carving. I even got an "at a boy" from Pascal on the drapery. 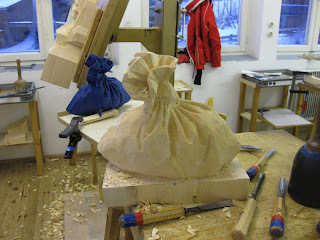 George finished up his carving of a "sack with knot" that came out beautiful. 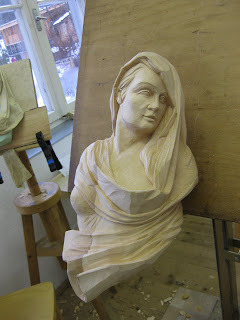 He has done this carving once before in Alabaster. 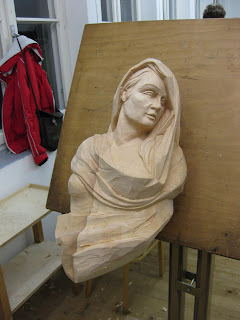 George started his second carving today of a stylized Madonna and Child. Tomorrow is a short day and we will finish up at noon and later meet at the Gastube (Restaurant) to ring in "Sylvester". The figure is well on it's way now. No major blunders, as of yet. Pascal, of course, is great and he is always willing and able to get you out of trouble and demonstrate techniques for you. 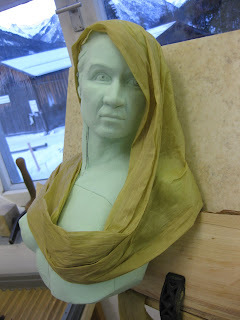 Today I got the face roughed in and started the drapery. 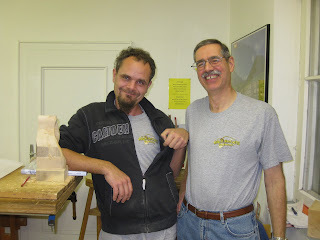 Pascal demonstrated on an area for me showing me how to start by using the skew chisel, followed by and assortment of other tools. The goal here is to simplify what you see in the actual fabric, going first for the major lines. He explained how one would put more detail into areas that were under tension, and contrast that with softer lines and less detail for the areas that are not as compressed. You learn a lot by just watching how he maneuvers the tools and his choice of tools depending on where and what you are working on. 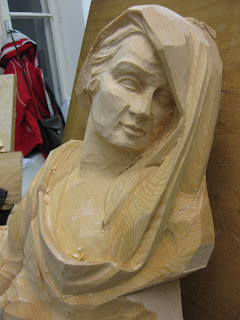 I've posted several pictures of today's progress. 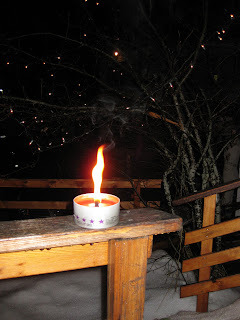 This is my third visit to the Geislor Moroder School, in Elbiganalp Austria, for their New Year's Week classes. The classes are full this year with three full time classes on going. Mostly German speaking folks. George Cooke and myself are the only English speaking people here but fortunately quite a few German's speak some English. 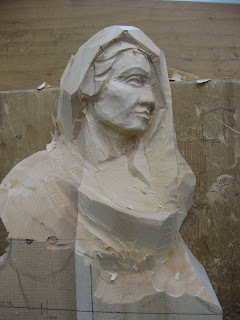 This year I wanted to do a drapery study in combination with another figure study under the tutelage of Pascal. I brought out a Signfoam carving I completed at home and a piece of silk. 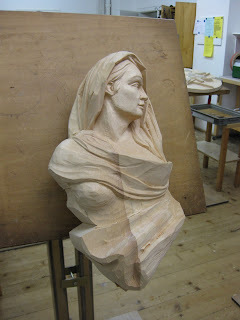 Pascal showed me a nice way to wrap the figure of a woman's head with the silk and I have posted a pic of the model and the start of the carving in Pine.